I was off Tuesday and had my whole day mapped out. Well usually when you do that things don't go your way. And on this particular Tuesday nothing went as planned. And to understand the story you have to get to know me a little better. My middle name is not "GRACE" and that is a good thing, because I really have zilch! That's right I am a klutz of sorts. The times I have fallen down steps cannot even be counted. The boots I showed in my previous post and I commented how I got them broke in. Well that was thanks to my spill down our steps leading to the sidewalk. There are a few and let me tell you it was a fall. Bruises up and down my leg, however my boots were instantly broke in! The list goes on and on. Fast forward to Tuesday. Griff and I were getting ready to walk to school. Well wouldn't you know Cooper (a beauty of a Golden but no brains) got loose. It was 755a and the bell rings at 805a so G and I headed out to play Cooper's little chase game. Thank goodness he did not follow us to the schoolyard, that is bad and has already happened once. So I dropped G off and wouldn't you know Coop was there sitting on the porch waiting for me to let him in. I should have stopped there. I proceeded to shower and get ready for errands. When I headed out I had to stop for gas. I put the pump on the automatic flow thingy and ran in to get a Diet Pepsi. Here is a valuable lesson don't do that! I forgot about it and drove off and yanked that hose right out of the tank, it was still hanging out of my tank. Thank goodness someone did it last week and it could be fixed. I was on my way and headed to Hobby Lobby and Michael's to get more decorations for the porch. I was excited to get home and put my visual thoughts into motion. I proceeded with putting the burlap garland up and adding fall leaves around the door. I was using my old rickety chair as a step stool. (Note to self always use a ladder) Well don't you know I lost balance and went flying down with the chair. Smacked my head and elbows on the porch, it was not pretty. Somehow I pulled myself up and headed to the phone to call my husband. I was then approached by my six year old who informed me I should have used a bigger chair or ladder. Thanks sweetie I will remember that next time. To make a long story short my husband and I headed to the ER. And let me tell you that is always a fun experience. Since my husband is a police officer we play the I arrested that person and that person game. That usually entertains for about 15 minutes and the people watching keeps me going till we get called. After xrays and waiting I have one elbow with a hairline fracture and tendon problem. Just a normal day in the life of Grace oops I mean Bristol! And if you drive by my house it's half decorated!! BRISTOL! I'm so sorry. You're not alone, my friend - I am quite graceful, too. Especially in college. I fell off my bike MANY times.....my legs are scarred with many a scrape!!! Hope you recover quickly - will be sending you prayers! Girl. I think you and me were seperated at birth. I feel your pain. Oh, no! I hope you are on the mend. Please be careful as you finish decorating! 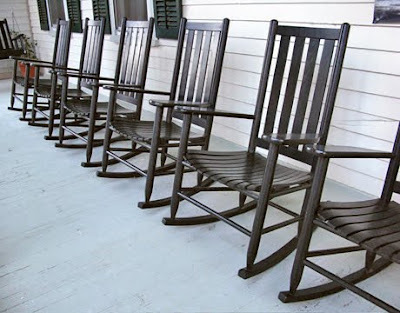 I love all of your rocking chairs on your porch. How fun! You poor thing...sending you well wishes. you poor thing! well..it'll be a good weekend for doing nothing right. My goodness! I hope you do feel better soon. I know how it is to be a klutz. I can't even walk across a room without hurting myself. It seems like every time that I do get on a chair I end up throwing myself off cause I feel like I am falling off. I can't wait to see your finished porch though. Here's to speedy recovery. I long to be graceful but, it's just not in the cards for me either! OMG I hope you are feeling much better soon.. That is so something I would do.. You are not alone. what a funny post! I'm really clumsy as well. I giggled out loud about the gas station! and here I am giggling again picturing it. What a story. I am really klutzy too and it only gets worse when I am pregnant. I am so sorry and I hope you heal quickly.